Since CLARIN-IT was established in 2016, its members have been organising a series of roadshow events aimed at the Italian Digital Humanities and Social Sciences community. At the roadshows, CLARIN-IT experts present tools and resources deposited in CLARIN repositories (such as the Italian ILC4CLARIN data centre), offer examples of how CLARIN helps to promote novel research with NLP tools, as well as provide guidelines on how to eradicate bottlenecks that hamper the growth of a newly established digital discipline and, ultimately, in which ways scholars can profit from research infrastructures. One of the most prominent events that the roadshow visited was the 5th Annual Conference of the Association for Humanities Information Sciences and Digital Culture, where the CLARIN-IT Coordinator Monica Monachini gave an invited talk about CLARIN in which she outlined how the Digital Humanities research community in Italy can benefit from the language technologies offered by CLARIN as well as from being involved in a large international research network based on interdisciplinary collaborations in a digital framework. In order to help train young researchers and thus guarantee a broader utilisation of computational tools and methods, a series of roadshow seminars aimed at students was also organised. The first seminars took place in October 2016 at the University of Parma and were intended both to promote CLARIN among students of Ancient Greek and to motivate them to adopt methods and concepts of computational linguistics and Digital Humanities in their studies. A second round took place from November to December 2017 with lectures concentrating on the methods, resources and instruments of a digital approach to philology. This included the encoding of text variants, digital repertoires of multiple editions of the same text and tools for their automatic alignment. During the lessons, CLARIN-IT provided examples of application of the TEI markup and Semantic Web technologies, by annotating geographical and personal references and linking an Ancient Greek lexicon in the Linked Open Data paradigm with a TEI-encoded fragmentary text of the poet Archilochus. Other roadshow events were aimed at the promotion of CLARIN among graduate students with lectures at the “Master in Digital Humanities” event at Ca' Foscari University on 3 November 2017 and as part of the “Digital Humanities, Web Resources, and Infrastructures” course at Venice International University on 4 December 2017. In addition, CLARIN-IT information events aimed at introducing the consortium, as well as CLARIN ERIC, to decision-making university figures and to new potential infrastructure partners and providers, such as the meeting on digital research infrastructures on 29 June 2018 which also involved members from the Italian academic senate along with professors and researchers in Digital Humanities and Social Sciences. A series of working days in 2017 and 2019 were dedicated to critical issues related to audio archives, such as legal aspects involved in collecting and (re)using audio data and possible ways to promote collaboration between linguists, speech scientists, speech technologists, oral historians and infrastructures. 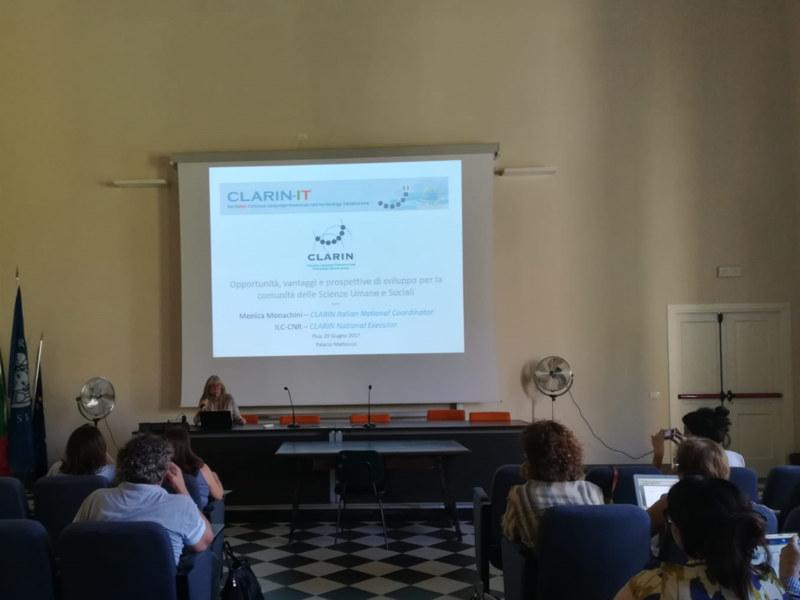 Monica Monachini giving an invited talk about CLARIN on 26 June 2017 at the University of Pisa. Blog post written by Monica Monachini and Valeria Quochi, edited by Darja Fišer and Jakob Lenardič.